Palestinian rights advocates are preparing for what is expected to be the largest coordinated series of Boycott, Divestment, and Sanctions (BDS) actions focused on a single target to date. The week of action will start on Black Friday, the biggest US shopping day of the year. This Global Week of Action — taking place from November 25th through December 3rd, with close to 100 actions planned on six continents — will target Hewlett-Packard (HP) companies, citing their role in providing key services and technology infrastructure that enable the Israeli military occupation of Palestinian lands and suppression of Palestinian human rights. This includes specialized technology made by HP companies that is used to support Israel’s military checkpoints, segregated ID system, illegal settlements, prison system, and naval blockade of the Gaza Strip. 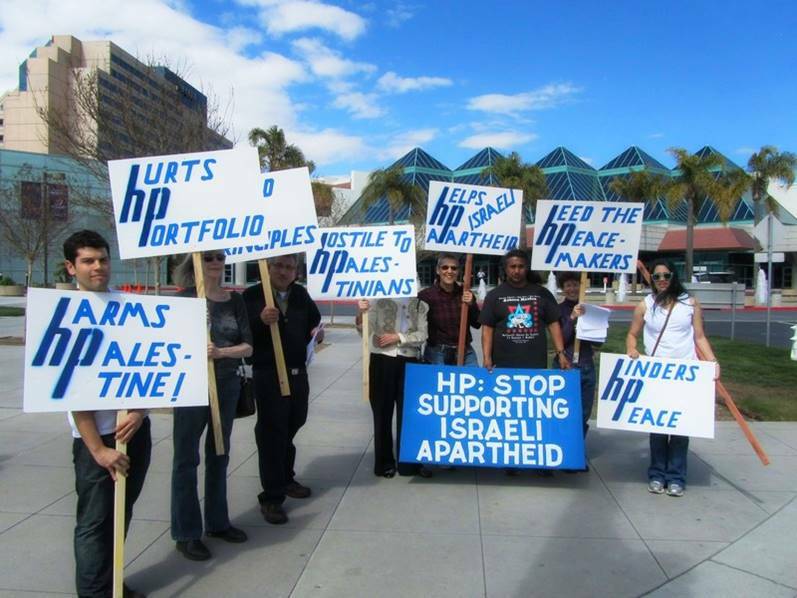 “Just as Polaroid was a key boycott target during the Apartheid era for providing imaging for South Africa’s notorious pass system, people of conscience today should boycott HP companies for providing imaging and technology for Israeli apartheid,” said Caroline Hunter, the Polaroid employee who discovered her company’s role in South Africa and helped launch the boycott campaign ending Polaroid’s involvement in the regime in 1977. Hunter is now active with the Mass Against HP campaign, calling on Massachusetts and its municipalities to stop contracting with HP companies. HP companies supply Israel with the Biometric ID Card System used to restrict Palestinians’ freedom of movement; provide servers for the Israel Prison Service where Palestinian children and political prisoners are routinely held without charge and torture is widespread; manage the communications centers, information security, and user support of the Israeli Navy as it collectively punishes the civilian population of Gaza through blockade; and provide various services to illegal settlements in the West Bank. Participating countries and cities include: Kuala Lumpur, Malaysia; Adelaide, Australia; Costa Rica; Cairo, Egypt; Hebron and Nablus, Palestine; Sao Paulo, Brazil; Bogota, Colombia; London and at least two dozen other cities in the United Kingdom; Rome, and nine major cities in Italy; Berlin and Cologne, Germany; Derry and Dublin, Ireland; Oslo, Norway; Amsterdam, Netherlands; Switzerland; Canada; and at least two dozen cities across the United States. Visuals from many of the actions will be available for use by the media. From mounting a replica of the Israeli Apartheid Wall to picketing HP Enterprise’s showcase European event in London on the same day as the United Nations’ International Day of Solidarity with the Palestinian People, actions will focus on demonstrating the failure of HP companies to live up to their stated principles. “Veolia, SodaStream, Ahava, and Orange’s decisions to divest on different levels from Israel’s occupation following global boycott, divestment, sanctions (BDS) campaigns have illustrated that complicity in Israeli oppression of Palestinians is bad for business. Campaigners worldwide are now sending that same message to HP companies” said Anna Baltzer, Director of Organizing and Advocacy at the US Campaign for Palestinian Rights. The Presbyterian Church (USA), United Church of Christ, Quaker Friends Fiduciary Corporation, Mennonite Central Committee, and Unitarian Universalist Association have already divested from HP companies due to their involvement in the occupation. HP split into two companies, HP Inc. and Hewlett Packard Enterprise (HPE), last year, and two more spin-offs are projected. The various HP companies share certain logistical infrastructure, governance, supply chains, and technologies with one another, and they all draw on the HP brand’s long history of close connections with the Israeli military and occupation. For more information about the HP Global Week of Action, to speak with organizers, or for photos or video from events, please contact Karmah Elmusa ([email protected]), or Garik Ruiz ([email protected]).